WHEN: SATURDAY 21ST JULY 10PM, SATURDAY 28TH JULY 10PM, SATURDAY 4TH AUGUST 9:30PM AND SATURDAY 11TH AUGUST 9:30PM. 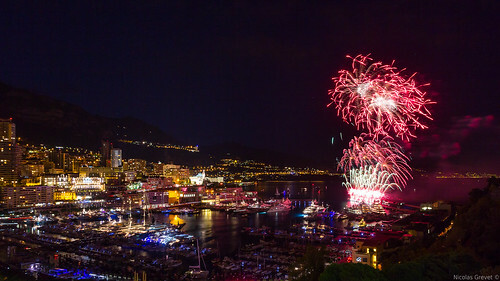 Fireworks lovers from Monaco and all around the world will be treated to a pyro musical spectacular once again this summer. The competition was first introduced by Monaco’s town hall in 1996 and since that time, the competition has grown into a must-see yearly event that takes place with two shows in July and two in August. The best European manufacturers and professional firing team’s make sure that they plan meticulously to ensure that the displays hit the set guidelines set out, before submitting it to the Jury and hoping they are chosen for a shot at the grand prize. The jury is made up of members of Monaco’s municipal council as well as other representatives. The participants are scored on points given out of 10 by each jury member. The criteria for this is based on the quality and originality of the pyromusical design, precision and synchronization, a variety of colours, choice of music, overall general impression of the show and the finale piece chosen. They also must make sure that the show must be 20 minutes long and be completely undisturbed. After all the competitors have produced their shows the points are then calculated, and the winner is announced. The displays themselves are set off from the Quai Rainier III, all along the area of Port Hercule there are powerful sound systems set up giving the spectators an outstanding experience of the shows.